What Are the Pros and Cons of Glass Display Cabinet? The glass display cabinet obviously is made of glass, due to the factor of which the characteristics of the glass store display cases for sale are transparent, so putting the goods in no matter the glass department store display cases or the glass retail store display cases can show the goods very well, at the same time showroom display cases also have a certain isolation and protection function. All in all, the glass display stands are beautiful, generous and practical. So now many industries will choose store fixtures display cases. 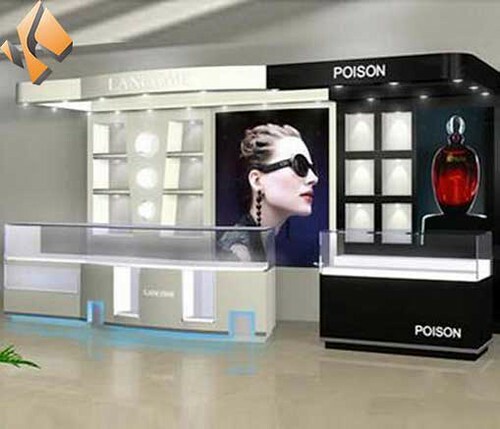 The most common industries of using the cosmetic display cases are jewelry display, mobile phone, crafts, gifts, sunglasses display, watch showcase, cosmetic display, tobacco and wine, and so on. And today, let’s get to know, what are the pros and cons of glass display cases? One, the glass material is transparent, the style of display type is very good, it is also very convenient for the costumes to choose the items. Two, the visual effect of the glass material is better than other materials, it is so transparent and bright, and it can also pass through the illumination and reflect the partial illumination, which can make your display cabinet cases very bright and beautiful. Three, the glass display cases are intuitively transparent, the appearance is generous and simple, especially in the summertime, it will bring a certain of very cool vibe. Four, it is convenient to do the cleaning. When cleaning, you only need to use the clean rag to wipe it clean. One, because of the glass material, the glass display cases are very smooth and tide, it is also easy to scratch, and it is not easy to repair the scratch, which is easy to affect the overall beauty. Two, the glass is fragile, so the glass display cases have certain protection function, but this is not enough strong. With a strong external force impact, it can be easily broken. So you need to take out and put in the items from the glass display cases gently and lightly. The particularly strong collision is absolutely not allowed.